___Print2canvas.co.uk is the UK's leading supplier of digitally produced canvas prints. Hello and Welcome to Print2Canvas, the premier source for digitally printed photo canvas prints online. Do you require a more contemporary look for your current decorating project and are struggling for inspiration? Do you feel like a change from traditional picture frames, paintings and posters? For an exciting, fresh and modern way to brighten up your home or office, look no further. Print to Canvas will have something for you in the form of photo canvas prints. print2canvas can transform your photograph into a unique work of art. Whether it's a favourite holiday snap, an image taken with your digital camera, or maybe an old black and white family photo. 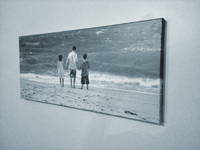 Any picture can be turned into a fantastic large scale canvas print. It's an ideal way to transform your home and business space, or perfect as a unique gift. A canvas print is when a photograph is printed onto a canvas material which is then stretched (sometimes called gallery wrapped) onto a wooden frame and then fixed to the wall. The result is a picture that looks as though it is suspended from the wall giving a very modern appearance and style. Canvas prints can be made from your own personal photographs or stock images that are available from our online art galleries. Here at Print2Canvas we only use the best 100% pure cotton canvas that is 380 gsm thick. We do not use any cheap PolyCotton blends for any of our printing. Once the canvasses are printed, they are individually hand stretched over a wooden pine frame of the highest quality. We take special care to make sure each and every print comes out perfectly. All of our printing and framing is done at our in-house studio in Lancashire. In order to ensure the highest quality, we have assembled a team of talented professionals and provided them with a fully equipped framing studio, resulting in a perfect piece of wall art every time. We control the entire production process and do not contract any of the work to any third parties. All of our prints will arrive to you framed and ready to hang.There is no construction required by our customers. We even supply a free hanging kit for every print. Instead of simple Sepia Tone artwork that doesnt match your living space, create a Duotone masterpiece with any colour like this photo that was tinted with a blue to match the living room. Do you have a series of photos and you can't decide which one to put on canvas. 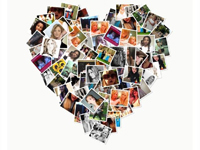 This love heart canvas print has over 50 photos on it and the price is just the same as a regular canvas print.